Today’s UN report on the devastating effects of the Syrian war on a generation of children is yet another reminder of the horrors of the situation. Millions in Syria have become casualties of the conflict over the last two and a half years, but the recent announcement of a 22 January 2014 date for the Geneva II talks on the future of Syria is a ray of hope in the darkness – and gives added impetus to the Open Doors Save Syria campaign. Already over 250,000 people from more than 70 countries have signed a petition urging all those with influence and power to do everything possible to protect the lives, livelihoods and freedoms of all the people of Syria and in particular safeguard the future of the Christian communities. By Tuesday 10 December—International Human Rights Day—they hope to have 500,000 signatures that will be presented simultaneously in New York to the UN missions of the five permanent members of the Security Council and to many of their embassies across the world. In the UK a request has gone in to present it to David Cameron at 10 Downing Street. 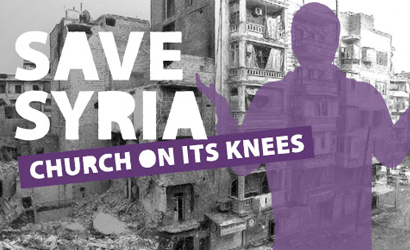 Stephen Rand, Advocacy Director for Open Doors UK & Ireland, explains that the campaign has been designed to ensure that the voices of Christians in Syria, particularly vulnerable and targeted in this terrible catastrophe, are heard. The Open Doors Save Syria campaign is one answer to his question. Please take a moment to sign the petition and show the Christians of Syria that they have not been forgotten.